One of the most significant challenges facing today’s active investor is how to make money during the times when markets are going nowhere. Bookshelves are groaning under the weight of titles written on investment strategy in bull markets, but there is little guidance on how to invest in range bound markets. 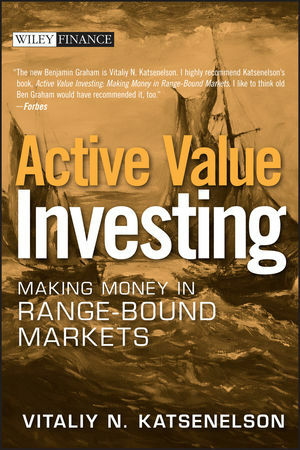 In this book, author and respected investment portfolio manager Vitaliy Katsenelson makes a convincing case for range-bound market conditions and offers readers a practical strategy for proactive investing that improves profits. This guide provides investors with the know-how to modify the traditional, fundamentally driven strategies that they have become so accustomed to using in bull markets, so that they can work in range bound markets. It offers new approaches to margin of safety and presents terrific insights into buy and sell disciplines, international investing, "Quality, Valuation, and Growth" framework, and much more. Vitaliy Katsenelson, CFA (Denver, CO) has been involved with the investment industry since 1994. He is a portfolio manager with Investment Management Associates where he co-manages institutional and personal assets utilizing fundamental analysis. Katsenelson is a member of the CFA Institute, has served on the board of CFA Society of Colorado, and is also on the board of Retirement Investment Institute. Vitaliy is an adjunct faculty member at the University of Colorado at Denver - Graduate School of Business. He is also a regular contributor to the Financial Times, The Motley Fool, and Minyanville.com.